Import Files will open a window box, which will ask you what files you want to open. You can also do this by dragging files from directories, directly into Tuniac. It should be stated that the function will not open directories. If you want to open directories, you should use the Import Directory function. You can also import m3u and pls files in here. 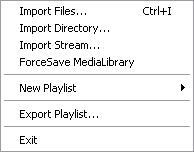 Import Directory will open a window box, which will ask you what directory to look in for adding songs. It will add all the files Tuniac can read from within the chosen directory. It will work recursive in doing this. The same can be achieved by draggin directories directly into Tuniac. If you want to add specific files you should use the Import Files function. In the process of browsing the directories, m3u and pls files will be read too. Import stream will let you add url's from the Internet of online stream providers. These often are radio stations (but may also be other kind of streams) that you may want to listen too. If so, you can use this function to add those stream sources to a playlist or just the media library. To do so you add the stream url in the box that appears on chosing this function. These are the way you can follow to add streams from the shoutcast website. Go to the shoutcast website (duh), it's http://www.shoutcast.com. Use your right mouse button on this button on the site, corresponding to the radio station you want to use and save the pls file on your pc. Drag the pls file into the player. Click on (one of) your added stream(s) and enjoy listening to it. Open the pls file you just saved using a thing like wordpad. It should look something like this. Add the stream you want to listen too into Tuniac. You do this by using what comes after the File1=, or the other corresponding places (see red rectangles above) and by pasting that information into the Import Stream dialog. Then push enter. Click on your added stream and enjoy listening to it. When using this function, your media library will be saved immediately. This will prevent you from doing a lot of work creating a very good media library and then losing it later if your pc crashes or something else happens. 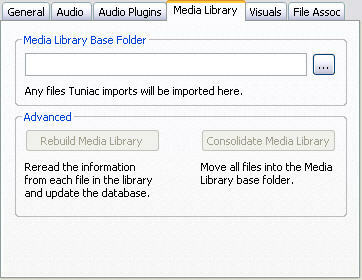 Normally the media library gets saved only when closing Tuniac. This function will create a new empty untitled normal playlist. This can also be done by using the playlist manage tools. This will export the selected files to a new playlist. In the window that will popup, you will have the choice between different kinds of playlists. When you choose this function, Tuniac will close. This is for editing track information. Explanation will follow when function in finished. This views the song that is currently playing in your media library or when your playing a playlist, in that playlist. 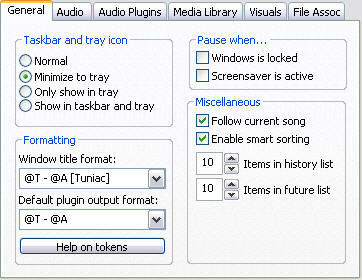 Here you can select what info Tuniac will display in the media library and in the playlists. With this function you can enable always on top. This lets the program keep focus, even when not being the active window. Here you can change your preferences. For the options see Edit: Preferences submenu. Here you can control how Tuniac behaves in the taskbar and in the tray on running and how it responds to minimizing its main window. In the normal way the program will be showed in the taskbar while running and shown on screen and on minimizing will stay there. With minimize to tray it will be on the taskbar while the window is open and will minimize to the tray. Only show in tray keeps the program in the tray at all times and the last option will keep the program shown in the taskbar and in the tray in both circumstances. Here you can decide what the windows title should look like and what information the plugins should use. The window title codes will be shown after you click the Help on tokens button, or when you hover over this button. Presets can also be chosen with the drop down lists. Here you can choose if the player should pause on locking Windows NT systems, or when the screensaver becomes active. Here you can choose if the player follows the current song. This will keep the song that is currently played in view. Smart sorting, will sort songs ignoring "a" and "the" in front of files/artists/albums. The history list and future list items control on how long these lists will be when right clicking on the previous or next button. 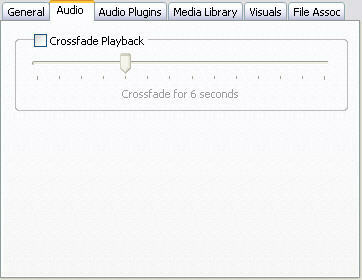 Here you can decide if you want crossfading on and how long a crossfade between songs should take. 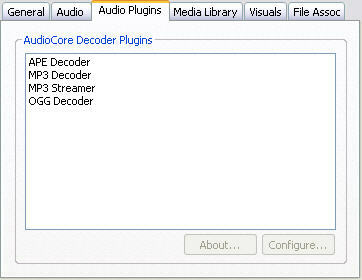 Here the plugins are listed. If options for configurations are available you can change them using the configure button. Here you can change how quickly to updat visuals. 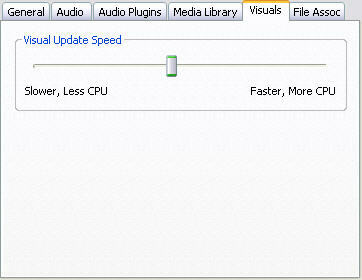 The faster you want it to update, the more CPU power it will use. In this menu you can change your preferences with respect to file associations. 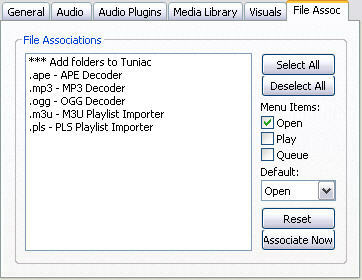 You can associate certain files to Tuniac and chose what to do when double clicking files in their folders when they are associated to the player. Soft pause is to stop playing after finishing the currently playing song. Start playing the next song. Random next is to go to a randomly chosen next song when you seem to always hear the same song again and again and you just want to go somewhere else in a playlist. Using it will make the previous song function not usable for one song, unless in shuffle mode, where it will just behave as the next function would. Start playing the previous song, or with use of the ctrl button it will start playing one song backward in history. Here you can change your repeat behaviour. 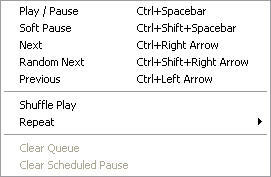 For the options see Playback: Repeat submenu. This will clear the queue that has been made. You can undo the pause here command with this option. No songs will be repeated. The current playing song will be repeated. After finishing playing all the songs, it will restart playing all the songs again. This will replay the files in the queue. Change the display mode to the source selector. Change the display mode to the visualisation window. This is to access these pages, for now you have to access them via the start menu of Windows. This is to update Tuniac when that function becomes available.